Finishing the inside of a horse a trailer takes some planning. The interior includes the floor, walls, ceiling and any front, rear or side barriers. These barriers contain the horses in a multiple-horse trailer. They must function correctly to keep the horses safe while traveling. The whole interior needs to be evaluated for safety and functionality. Assess any cosmetic work, too. When you've finished, the inside of the horse trailer will be safe, functional and presentable. 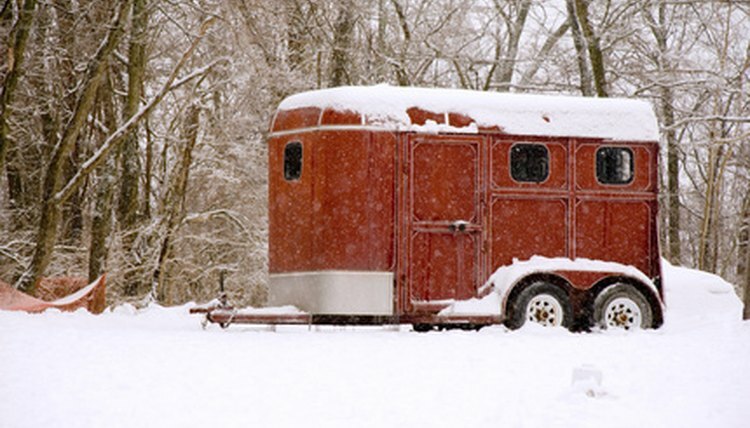 Scrutinize the interior of your horse trailer for safety and functionality. The floor is made of wood. Replace any boards that are spongy, sagging or pitted. This is best done by a professional. On top of the boards are mats the horses stand on. These should be flat and seamless, with no rips or jagged edges. The walls, ceiling and doors should be solid, without holes or protruding sharp objects. If there is a side or back ramp, that too needs a mat. Between the stalls where the horses stand are barriers that must be securely fastened to the ceiling and floor so they don't fall on the horses. They also should be padded--seamless padding with no sharp edges. Assess the interior for cosmetic work. Look for rust spots, peeling paint, torn mats, ripped pads or caked-on dirt. All of these things affect how safe and workable your trailer is, and they shorten the life of the trailer if not taken care of. Pressure wash and scrub caked-on dirt on the walls, mats, ceilings and doors. Avoid using strong cleaners, as they are not safe for horses. Don't let excess water puddle on the trailer floor. Let the trailer dry thoroughly before the next step. Sand off rust spots and peeling paint. You can do this by sand blasting or with a sander. Wipe down all walls, doors and ceiling surfaces. Paint walls doors and ceiling with an interior horse trailer paint. A paint for cars works well. Avoid dark colors because it can cause problems loading horses. Roll or spray on the paint, or have a professional do the painting. Replace ripped mats or pads.